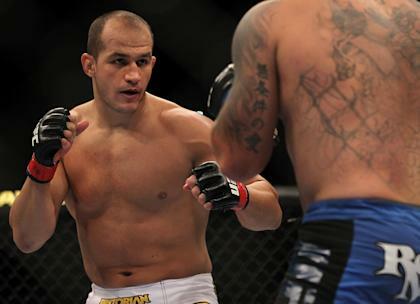 LAS VEGAS – Junior dos Santos stretched out his entire 6-foot-4 frame, filling an oversized chair in a locker room at the MGM Grand Garden. Minutes earlier, he'd completed a surprisingly intense workout, just days from his three-round heavyweight bout Saturday against Mark Hunt in the co-main event of UFC 160. He furrowed his brow and took a deep breath as he pondered a seemingly bizarre, but now pertinent, question: Would he quit, or at least change his methods, if he knew for certain that his job could create health issues that would last the rest of his lifetime? He wiggled in the chair and clasped his hands behind his head. "That's a good question," he said. "That's a really good question." A period of silence ensued before dos Santos shifted in his chair and began to answer. A smile began to crease his face. "You know, I think it's worth it," he said. "This is my life. This is everything I have. People don't know how hard we [work] and what we sacrifice to [be successful]. MMA athletes train so much, you know. I would continue to [do what I'm doing]. I want it so badly. I want to give everything I have to this. This is everything to me." His life changed at 21 when, by happenstance, he decided to take a jiu-jitsu class. He hadn't been a very good athlete, but wanted to get into shape. Something clicked with jiu-jitsu and it altered his life. The eight years since have seen him become one of the elite fighters in the world. But the sacrifices he's made and the suffering he's gone through to reach the top of the UFC nearly defy belief. 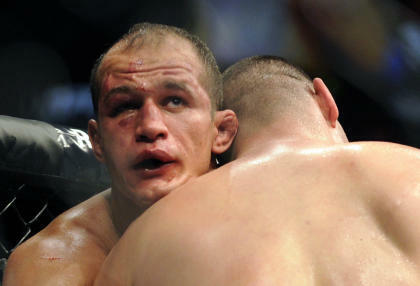 He admits that he vastly overtrained for his title defense at UFC 155 on Dec. 29 against Cain Velasquez. He peaked, he said, 15 days before the bout. He took a severe beating in losing his heavyweight championship to Velasquez via a five-round decision. The morning after the bout, his urine was a very dark brown, the color of Guinness Stout beer. He wasn't urinating blood, as some fighters do after a grueling match. Rather, the brown coloration of his urine was due to rhabdomyolysis. His muscle fiber was breaking down and getting into the blood steam. It is a treatable condition, but it can be fatal under certain circumstances. There are numerous causes, but one is extreme physical exercise. Dos Santos trained so fiercely that he was pushing his body well beyond its natural limits. He's consulted with experts at Nike, and brought in Alexandre Dortas, a Brazilian physiologist, to monitor various levels in his blood. After the loss to Velasquez, doctors found that his creatine kinase (known as CK) level was far too high. Creatine kinase is an enzyme in the blood that can be used to diagnose rhabdomyolysis. The average adult male has a CK level under 300, Dortas said. He said an elite athlete can get that level as high as 350. But after the Velasquez fight, dos Santos said his CK level was over 1,400. "He just wasn't getting enough rest," Dortas said. During the training camp for the Hunt fight, Dortas has been a familiar presence. He approaches dos Santos several times during a workout and pricks a finger to draw blood, which he uses to test seven levels in dos Santos' blood to make sure that he doesn't overexert himself. Dortas has recommended two, 75-minute practices a day and only a two-month training camp. That, he said, would be sufficient for dos Santos to get into elite condition, but it would provide his body with enough recovery time to avoid negative complications. 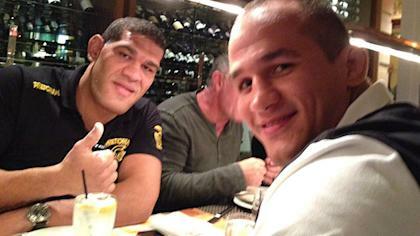 Until the camp for the Hunt fight, dos Santos would train twice daily for up to three hours a session. His camp for UFC 155 was more than three months long. That's not the way to ensure a long and healthy career, and if there is anything dos Santos wants, it's to fight as long as he possibly can. Dos Santos, 29, said he hopes "to be a Randy Couture guy," and fight until he's in his mid-to-late 40s. "I just love this," he said, smiling broadly. But he's already put his body through extraordinary strain. Prior to his May 26, 2012, title defense against Frank Mir at the MGM Grand, dos Santos severely injured a muscle on his right side. It was torn away from the bone and was separated. He never should have fought, and simply postponed the bout until he was healthy enough to compete safely, but stubbornly resisted suggestions that he should pull out. He was in agony whenever he threw a right hand, and forget what it was like when he was hit in the area. Dos Santos won the bout by second-round knockout, but said it would not have been good had Mir kicked or punched him in that six-inch injured area on his right side. "Honestly, I probably would have gone down," he said. Dos Santos said he resisted postponing the bout because he's not a quitter, but also because he invests a lot financially in every training camp. A fighter who doesn't fight doesn't get paid, though he's still responsible for his training camp expenses. "That's a lot of money we spend to do a training camp," he said. "I just don't want to lose that for nothing. And you know, I believe in myself. I believe I still can [fight and win], even with the injury." He proved that when he defeated Velasquez on Nov. 12, 2011, at UFC on Fox 1 in Anaheim, Calif., to win the heavyweight title. He'd badly injured a knee during that training camp. "It was gnarly," one of his aides said. There was legitimate concern within his team that he might not be able to fight. He brought an orthopedic surgeon with him from Brazil to be available to assist him in the final week before the fight. He said Tuesday that he's healthy heading into the bout with Hunt, and he's clearly intense. Normally an ebullient, friendly guy, he showed a steely resolve as he pounded the focus mitts with coach Luiz Dorea and went through his grappling training. He'll earn another title shot if he wins, and he doesn't want to leave anything to chance. He's hopeful of facing Velasquez again in a rubber match for the title. Velasquez will defend the belt on Saturday in the main event of UFC 160 against Antonio "Big Foot" Silva, dos Santos' close friend. Dos Santos believes his career will be defined by what he thinks might be as many as five, or even more, bouts with Velasquez, just as Muhammad Ali was defined by his series with Joe Frazier and Sugar Ray Robinson was defined by his with Jake La Motta. Beating Hunt, he said, is of the utmost priority, not only because he's a fierce competitor and feels the need to win at everything he does, but also because it will move him a step closer to another showdown with Velasquez. "People will be talking about our fights for a long, long time, I believe," he said, grinning as usual. "That guy hasn't seen the last of me." As long as he treats his body the way he would a high-performance sports car and doesn't push it well beyond its limits, dos Santos has a great future ahead.